Summer Meal Series #9: Tuna Melts!? After returning home from two weeks of vacation, my wife and I planned out a very nice summery meal that would have made a great post for the Summer Meal Series. It required one key portion of the meal – either a pork shoulder or a few chicken breasts, depending on which way you wanted to go – to cook all day on low in a crock pot, then be used at the end of the day. Yesterday morning, my wife and I woke up and planned out our day. She volunteered to get the pork shoulder cooking in the crock pot, after which we’d spend a pretty typical summer day at our house. She went downstairs, put it on to cook, and went on about her business. That evening, we pulled the shoulder out of the crock pot and began to shred it with forks, which was part of the recipe (don’t worry, I’ll likely use it again near the end of the series!). We both noticed that this piece of meat had to be the toughest piece we’d ever met – it simply was not tearing apart at all. Then Sarah realized what had happened. Instead of setting the crock pot to cook on low all day, she set it to merely keep food warm all day. The shoulder we had in front of us was warm but completely uncooked. And, naturally, because raw pork had been sitting warm all day, it was a health hazard and had to be tossed out. It’s now 6:45 PM. Our children are getting very hungry for supper and we want to get something tasty and kid-friendly on the table as quickly as possible. What do we do now? We brainstormed. In about two minutes, we took a lightning-fast inventory of the refrigerator (remembering, of course, that we were pretty low on food since we had just returned from a two week trip) and the pantry. And we came up with a plan. Tuna melts, with side dishes of sweet potato fries and a salad. We had the full meal on the table by 7:10 PM. Here’s what we did (I don’t have as many pictures as normal, of course, because we were running on extremely pinched time). The ingredients for the tuna melts were simple. 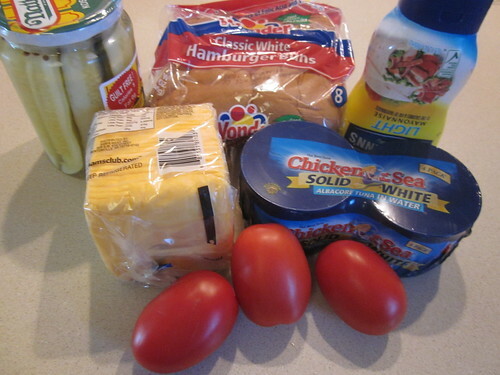 Buns, tuna, mayonnaise, tomato, pickles, and cheese. 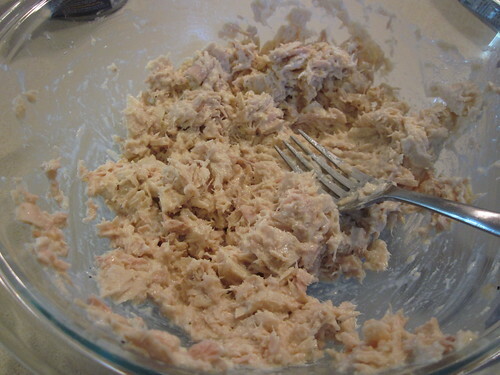 All you do is take two cans of tuna, toss the contents of the cans in a bowl, and add a bit of mayonnaise. The amount you add is really up to you – the more you add, the runnier it will make the sandwiches. Then, swipe two teaspoons of pickle juice from the pickle jar and add it to the mix. Stir, stir, stir. We then sliced up two tomatoes. 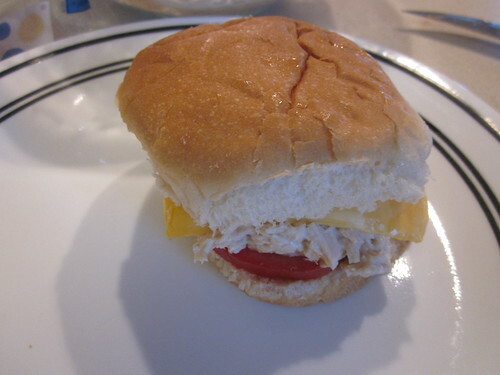 On each sandwich, we put a big teaspoonful of the tuna mix, a slice or two of tomato, and a slice of cheese. These made for nice little sandwiches. 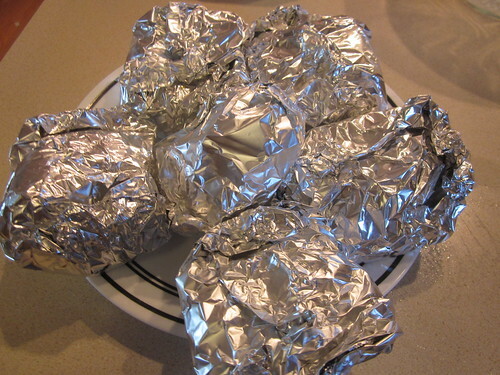 We then wrapped the sandwiches in aluminum foil and baked them in the oven at 375 F (about 190 C) for 10 minutes. In the end, we just had a plate of wrapped sandwiches on the table. Whenever we get a bargain on a bunch of sweet potatoes, we pre-make them into batches of sweet potato “fries” that our family loves. All we do is slice them lengthwise into quarter-inch fry shapes, then soak these fries in water for 30 minutes. When they’re done soaking, we pat them dry and put them into freezer bags in small bunches, freezing them. When we pull them out of the freezer, we dump the contents of the bag into very warm water until we can separate the fries. We then dredge them all through a bit of olive oil, lay them out on a cookie sheet, and sprinkle a bit of salt and pepper over the top. They go straight into the oven under the broiler for about a minute, then we pull out the sheet, flip over all of the fries with a spatula, then put them back under the broiler for about a minute. 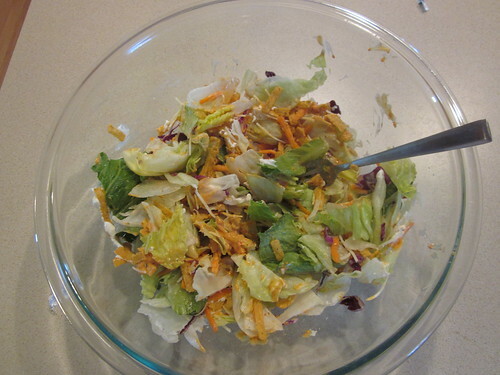 During the ten minutes that the other items were in the oven, I pulled out a lettuce mix we had picked up on sale at the store for a dollar, put it in a bowl, and put a bit of dressing in the bowl (actually, more than a bit – I poured in more than I intended to in the picture below). I then added a few pinches of shredded cheese and a few leftover tortilla chips to give the salad a bit of crunch. I tossed it all together with a fork, leaving us a salad. And that was our meal, from panic to dinner table in about 25 minutes. It was a hit. Our children liked every meal element, as did my wife. I don’t like sweet potatoes myself, so I merely ate a tuna melt and a big pile of salad for dinner. Here’s the big lesson to take home: a disaster like what happened at the start of this post is not a reason to order food and pay exorbitant costs for it. Be a little flexible. See what you can put together with what you have on hand. Most of the time, if you’re handy in the kitchen, you can quickly put together a reasonable meal in as lttle time as it would take for the deliveryperson to arrive – and much cheaper, too.